on Point Rendezvous, on the south side of St. John. 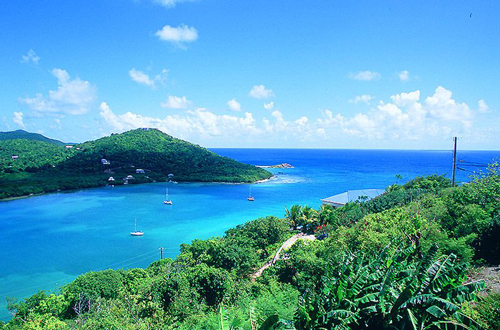 of the bay and the Caribbean Sea. 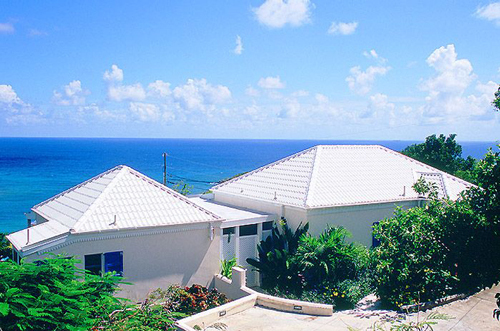 Wake up early and enjoy our wonderful sunrises. if you prefer relaxing in the shade. follow the garden path to the main entry of the home. 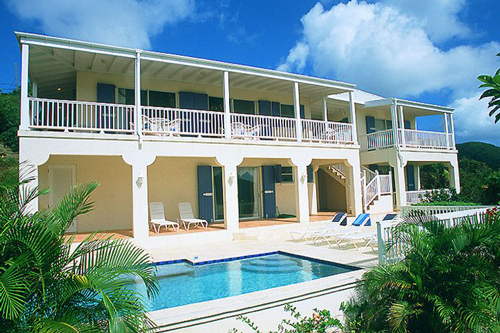 two more bedrooms and the pool deck. a beach umbrella, and masks and snorkels. which wraps its way around the room. a DVD player, and a collection of movies for your entertainment. stereo with CD, and high speed internet with wifi. with bar stools for a casual meal. A gas grill is located just outside, on the covered side deck. 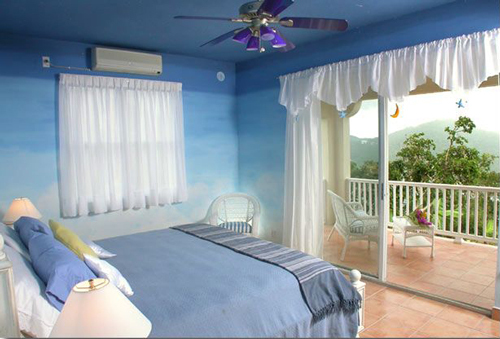 air conditioning, ceiling fans, sliding glass doors facing the views, and an attached full bath. 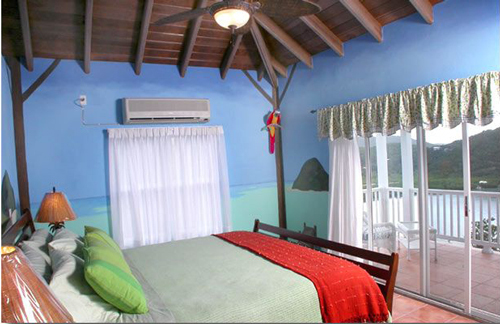 The owner is an accomplished artist, and each of the themed bedrooms is a delight with wonderful, colorful murals. which can only be accessed through the bedroom. 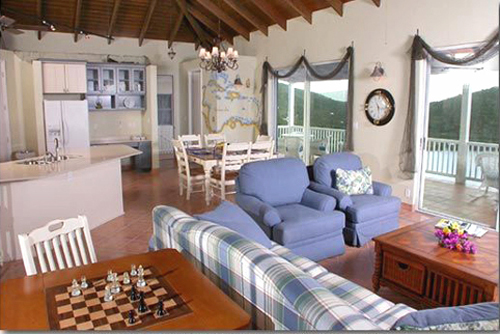 a private deck, which can only be accessed through the bedroom. if you wish to keep out the morning light, and sleep in! 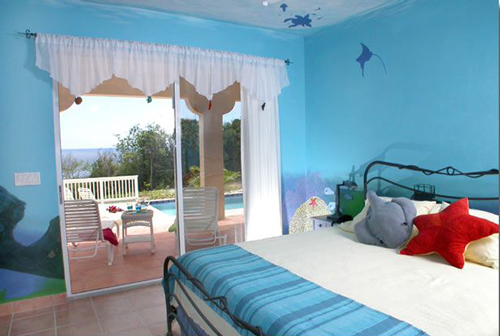 "Starfish" is the third bedroom and is located on the lower level. which steps down to the pool deck. 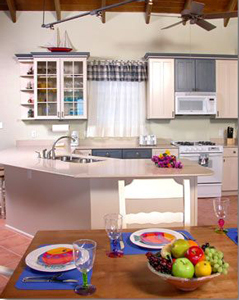 All three bedrooms are the same size and have comparable amenities. a family with older children. 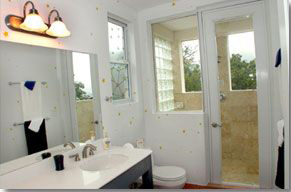 Step out the bathroom door into a fully screened shower and enjoy the view while you shower in complete privacy. A full laundry room is on the lower level adjacent to the bedrooms. 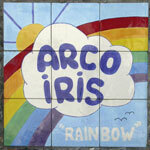 Arco Iris is less than three miles from Cruz Bay off the Southside Road. All the roads and parking area are fully paved.